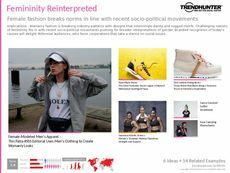 Find Better Ideas, Faster ® with a custom women's fashion trend report, our PRO Dashboard and 80+ categories of premium trend reports. The Women's Fashion Trend Report explores the latest innovation in the realms of both wearable and conceptual design. Standouts include apparel and accessory lines with pop culture inspiration along with garments that are designed with sustainability in mind. This report also explores the rising prevalence of gender-neutral clothing and looks at sportswear's evolution from casual to chic. Fashion designers will benefit from this report as it shares specific industry trends and beneficial consumer insight. It can also help retail stores ensure the products they sell meet the needs of the consumers. Lastly, it can help professional shoppers and buyers understand the latest trends within their profession. The Women's Fashion Trend Report exposes you to new themes and industry trends that will ensure your next collection is unique and meets the fashion-forward demands of modern consumers.